Bon Appetit gives its chefs the skills to build authentic flavor profiles. 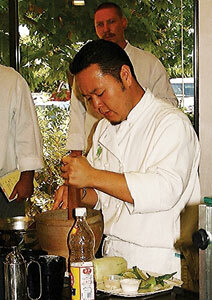 Culinary training is never on the back burner for the chefs and sous chefs at Bon Appetit Management Co. accounts such as Cisco in Petaluma, Calif., eBay in San Jose, Calif., Oracle in Redwood Shores, Calif., American University in Washington, D.C., Georgetown University Law Center in D.C. and the Art Institute of Chicago. Although hiring and retaining talented individuals is a prime objective, keeping them focused on creating authentic flavor profiles is the key to a successful operation today—no matter what the sector of business—according to Mark Zammit, director of culinary support for the Palo Alto, Calif.-based contractor. Prior to bringing in chefs for a session, Zammit identifies a local restaurant that specializes in the cuisine of focus. When the chefs arrive, dish after dish is brought out for sampling so that training participants can begin to understand the flavor profile. “We lay out an entire pantry of ingredients, plus we’ll hire a chef who is an expert in that cuisine to contribute to the development of the class training,” Zammit says. Native expertise: In preparation for an introduction in the months to come, training will begin early this fall with the focus on the foods of India. Zammit has been working with Indian cookbook author and culinary instructor Raghavan Iyer to develop the training course; Iyer will also travel from account to account with the Bon Appetit team of instructors. Beyond ‘culinary’: A similar three-prong approach featuring lectures, demos and the market basket concept was taken for Bon Appetit’s introduction of Zatar, which features foods of the Mediterranean region. Zammit and his team purchased the documentary, “Foods of the Bible,” from PBS in order to give chefs a feel for the rich history and culture of the region. Online requirement: Bon Appetit also offers an online training program with a focus on nutrition and healthful cooking that all chefs and sous chefs are required to take and pass with at least a score of 70%. As residents expect more culinary flair, Morrison targets its cooks for training. In senior dining locations across the country, residents are more likely than ever to be well-traveled, nutrition-conscious retirees who expect their meals to be expertly prepared, well presented, flavorful and healthful. To ensure that kitchen staff can satisfy those desires, Morrison Senior Dining has developed an Associates Culinary Training Series, or ACTS. The computer-based training modules detail basic culinary skills from roasting and sautéing to stir-frying. Sessions are taught at each account by a “Training Champion” certified by Morrison. Specific tips and guidelines are provided, including in what order to cook items as well as how to make sure the pan is really hot so that the vegetables or protein component are stir-fried properly and the desired crispness or browning is achieved. A range of needs: Seidl recognizes that there are many skill levels in any kitchen staff; while some cooks have a great deal of culinary training behind them, others do not. Chefs are competent in basic culinary techniques, but he believes that cooks need to know them as well—and he’s more than willing to teach them. Seidl notes that while DVD usage is not tracked, ACTS definitely is. “Those who aren’t using it get a little ‘love note,’” he says. “We set up a tracking system and it needs to be submitted monthly to the regional office. 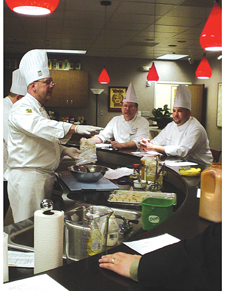 Correctional foodservice chief arms inmates with ServSafe training. Since the foodservice industry has an ever-increasing need for trained workers and since the prison “industry” would like to see the recidivism rate decrease, why not teach inmates kitchen skills that will help them get a job upon release? Louise Mathews, chief of foodservices for the San Diego County Sheriff’s Department, Santee, Calif., goes one step further: She believes that providing training leading to earned certification will make an even more positive impact. “For years I’ve wanted to do a certification program to help inmates get a job upon their release from jail, but for years they’ve not been arresting those who commit misdemeanors [who typically would be of a more trainable type]. Now there’s a new ‘misdemeanor workforce,’ who are still felons, but they’ve done something relatively minor like screwing up their parole. So I realized I could get some inmates for the [cook-chill] production center for six weeks. I use 50 inmates there to tray food and clean—not for cooking or baking. We teach them how to handle food, how to work in a warehouse handling inventory, how to pack trucks and use large cleaning equipment such as floor cleaners, utensil washers, tray washers, etc. In California they passed a law about two years ago that every foodservice location must have at least one ServSafe certified employee on site; therefore, a prospective employer would be interested in a certified applicant. Working through the Grossmont High School District, we hired a certified instructor. We award two certificates, one from Grossmont High School for competency in food handling, cleaning, sanitation, warehouse and inventory systems, and the second the ServSafe management certificate. We decided to use ServSafe videos; it’s usually eight hours of video instruction but we spread it out over five to six weeks. We repeat these videos until they [understand] it. The instructor gives a pre-test, then we order copies of the actual test for those who show aptitude and want the certification. If I had gotten two or three [applicants] every six weeks, I would have been happy, but now we’re getting 12 to 15 who pass the exam out of about 20 who take it. Overall, more than 120 people have been trained in t he past year. After release, some inmates have gotten jobs in Las Vegas and have said they used us as a reference—and that the ServSafe management certificate got them in the door. We started the program in June of last year. Over the past year we’ve expanded the program to include the East Mesa Detention Center with short order cooking, and about a dozen inmates from George Bailey Detention Center. Then we expanded to our women’s jail, Los Colinas Detention Facility, and Camp Barrett Juvenile Probation Camp for incarcerated 15- to 18-year-olds [under the San Diego County’s Regional Occupation Program]. Some of our inmates pass the ServSafe exam with scores as high as 93, 94 or 95 and can then qualify as instructors. It’s not an easy test and I was amazed at the results. I’ve already asked for additional funds from the San Diego Sheriff’s Department to get another instructor in order to expand the program I was so happy to get this accomplished before retiring from corrections. Our governor is funding jails with programs to give inmates skills so they won’t come back into the system and this program is a perfect fit.